Either one of these versions would make a great breakfast on a holiday morning like today. Let me explain the "Cooking School" in the title. I decided that since summer was upon us, that this would be a great way to spend some time together in the kitchen. Her first request- French Toast. French Toast is not something that I make often. I guess because I usually feel like it doesn't come out quite right. Well folks- "Cooking School" has cured the problem. I decided that we would make French Toast 2 ways- the traditional way and the baked way. I searched for a basic French Toast recipe and found one by Alton Brown that fit the bill. It had a few extra steps that I have never seen before, but I have watched an episode or two of Good Eats, so I knew that if anyone had perfected a technique, scientifically, it was him. He uses half & half in the custard mixture and has you let the bread drip over a wire rack before you cook it, but I think what gives his French Toast the perfect texture and taste is the last step. He has you warm the oven and the french toast goes into the hot oven for 5 minutes, which puffs it up and makes it turn out restaurant style. 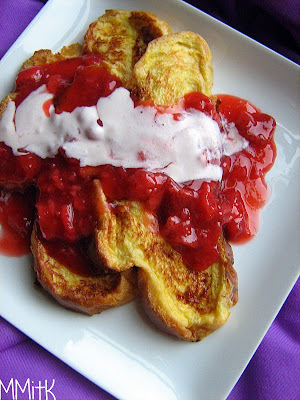 We topped our french toast with a homemade strawberry sauce and strawberry whipped cream. 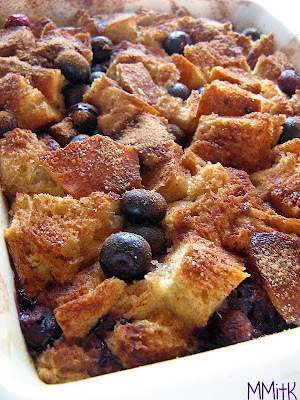 Baked french toast is just a slightly healthier version of bread pudding, in my opinion. I have made it a few times in the past. This recipe is basic and very good. We loved it. 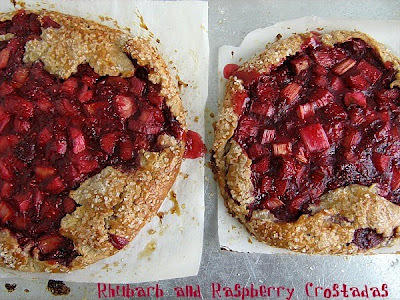 Of course we didn't make these 2 recipes in the same day, but it was a lot of fun. My daughter decided that the next series in our "Cooking School" should be salad, because these were a little on the rich side! 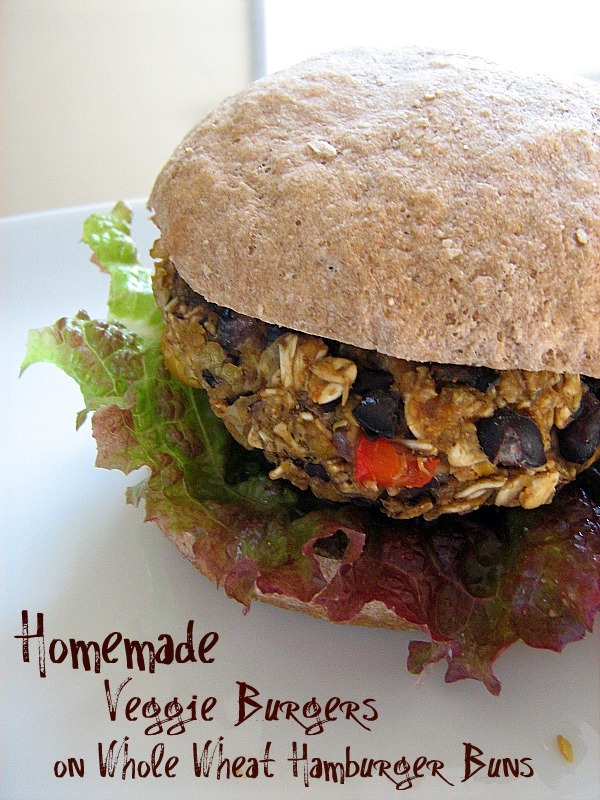 I have been wanting to make these Veggie Burgers for a very long time. I saw the recipe and saved it for later. Somehow it just didn't feel right to make these bright Veggie Burgers during the colder months, so now that the weather is beautiful and sunny and people are starting to cook out and use the grill more, I decided to try them. I think one of the other reasons I kept putting them off is because it seemed like there was a really long list of ingredients, but once I got down to it, I realized it wasn't really that lengthy or complicated. I decided to throw them together on a day when I was busy chopping and dicing things for a couple other recipes and then I formed the patties and let them sit in the fridge for a couple of hours. I also decided to make my own buns, just for fun. A whole wheat bun seemed to be the perfect partner for a veggie burger. These burgers were really good. I loved the texture and they had great flavor. These are a great way to enjoy a meatless option whenever you want a burger. I also have to add that I really love being able to go to my garden and cut fresh lettuce whenever I want. The red leaf lettuce I used on this burger is really yummy. If only you could see the dreamy picture of these in the latest issue of Everyday Food. My picture just doesn't do it justice. In the magazine these are absolutely dreamy looking. High and cloud-like. I knew these would be the way I would use the rest of my freshly-picked strawberries. The base is just a strawberry puree that is treated like a granita- scraped with a fork, until slushy. The top is a meringue/whipped cream mixture that really does remind me of a cloud. Soft and smooth. Everyone in my family liked these bars. The only problem I had was that they were impossible to cut into squares directly from the freezer. I had to let them sit for a couple of minutes and soften a bit, so I could cut them. 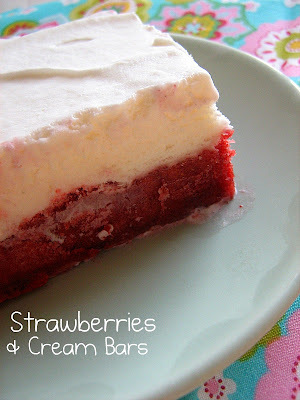 The strawberry layer also gets really hard if you prepare them in advance. We ended up letting them soften a little bit and then mixing them together in our individual bowls. In a large bowl, beat the egg whites on high until foamy. 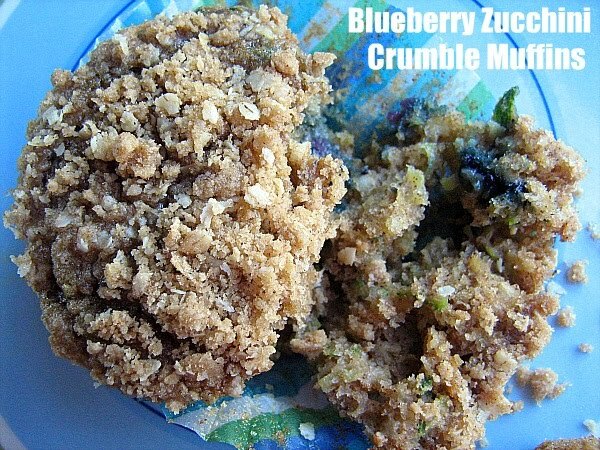 With mixer on medium, gradually add 3/4 cup sugar. Increase speed to high and beat until stiff, glossy peaks form, 3 minutes. In another bowl, whip the cream and vanilla until you have stiff peaks. With a rubber spatula, gently fold the cream into the egg white mixture. Pour the cream mixture over the fruit mixture and smooth the top. Freeze until firm, about 4 hours (or covered, up to three days), before cutting into 12 squares. My daughter has really taken interest in helping me in the kitchen. She has always wanted to help, but now she really wants to get her hands dirty and do it all. This was the perfect thing for her to help me with. 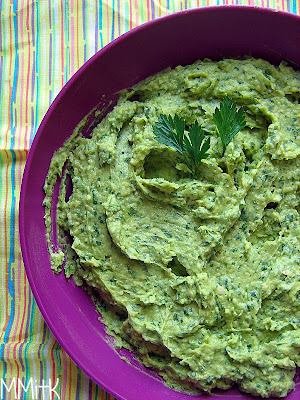 You just dump the ingredients in the food processor and in a few minutes you have a smooth, creamy, delicious dip. It tastes like guacamole, but it acts like hummus. What does that mean? I'm not sure, but it is good. My hubby doesn't like guacamole, but he really loved this dip. 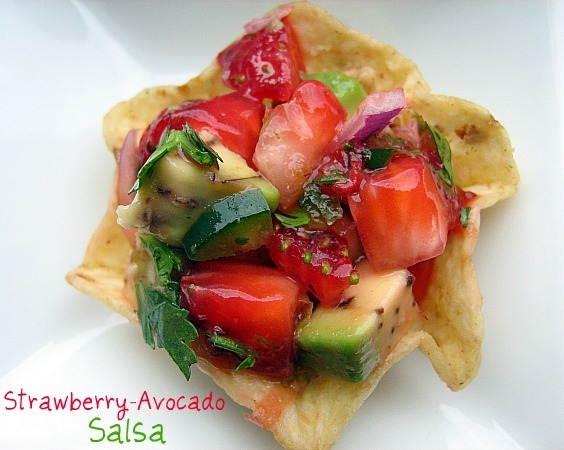 It would be a great spread for a taco, breakfast or sandwiches/wraps too. We enjoyed it with pita chips, bell pepper strips, and carrots. and 1 ripe avocado, roughly chopped. Last week we made one last trip to the local strawberry-picking farm. I went once when my Mom was here visiting, but my 6-year old missed it and she didn't let me forget that she wanted a chance to pick strawberries too. The strawberries were about on their last leg out there. Very ripe and I knew they weren't going to last in the fridge for more than 24 hours. That is where this cake came to the rescue. I needed something quick to take to someone and this was the perfect thing. 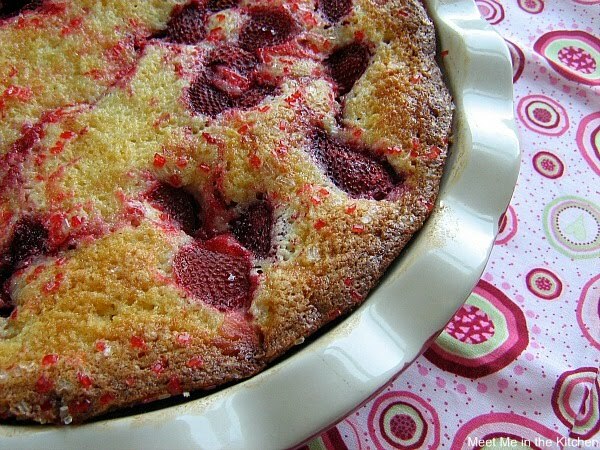 Super simple to mix together the cake, the strawberries are dotted on top and it bakes up like a charm. My daughter and I had to sneak a little slice and boy was it delicious. Just like strawberry shortcake, but actually way better and in cake form. I whipped up some strawberry whipped cream to top it. My hubby ate the leftovers for breakfast the next day and loved it. I don't really like sweet potatoes that much. I love what sweet potatoes can do in baked goods, but I've never cared for them at Thanksgiving, especially when they are made even more sweet by adding sugar, marshmallows, etc. I don't mind an occasional baked sweet potato or sweet potatoes that are mixed in with other things, but I know that they are healthy choice, so I want to like them more. I saw this recipe over at Joy the Baker and I knew that if anything could help me to like sweet potatoes more, it would be turning them into fries and using curry powder to flavor them. I've used the egg white technique before in helping an item crisp up in the oven- on these Spiced Pecans, so there wasn't anything really too new in making these fries. I already know that roasting veggies in the best way to cook them, so I was pretty sure these fries were going to be spectacular. And they were. I made them for lunch one day and they were so good. 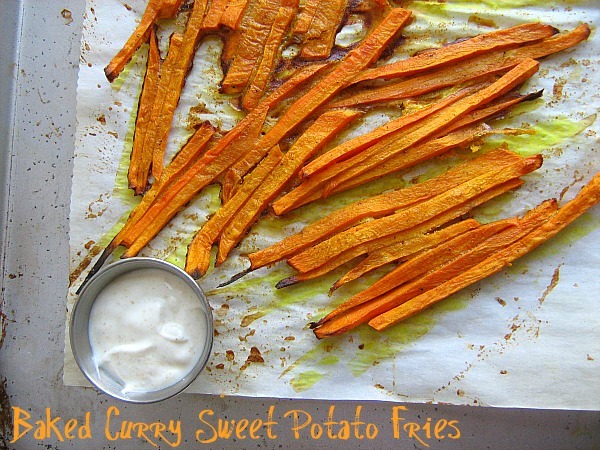 I love the flavors of the spices and the yogurt dip was the perfect thing to go with them. My photo doesn't properly showcase how yummy these turned out, so make sure to go and look at the Joy's post and pictures. My 4 year old daughter was sitting on my lap when I was editing this picture and she said "Oh, that dinner was scrumptious! Do you know what scrumptious means?" That just about made my day. And the other thing that made my day, in fact made my week, is that School's Out!! Our Summer Break has officially started! I'm so excited I can barely stand it. The kids can stay up late and sleep in and we can do whatever we want to! (After we do our daily chores and reading/writing journal practice, of course!) We will be spending a lot of time in the pool and there are a few other activities that we are really looking forward to. Now, back to the food. 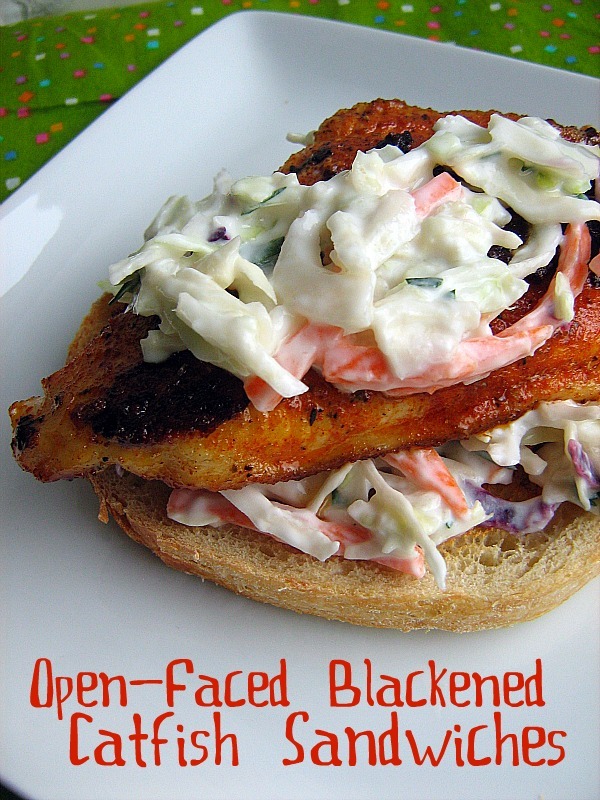 I found this recipe in the latest issue of Cooking Light and I already had a bag of tri-color coleslaw mix in the fridge. Not because I use it to make coleslaw, but because it is a good filler for lots of different sorts of dishes. Soups and stir-fries, or those nights when I just make a hodge-podge mixture of veggies. My family loves fish and I love blackened fish, so I grabbed the few ingredients that we needed, including some fresh catfish. Can I just say that fresh catfish that has never been frozen is soo good. This was the best catfish I have ever had. I didn't put the full amount of the blackening seasoning on the kids fish because I thought it might make it a tad too hot. My husband and I got the full seasoning and it was good. I don't usually have sourdough bread on hand, so I bought a fresh loaf of that too, and discovered another thing that my children like. I don't really like traditional coleslaw because it either contains mayo (yucky) or too much vinegar for me to handle. I like that this coleslaw-type topping used plain yogurt with a little lime juice, honey, and cilantro to give it some flavor. So its been about 6 weeks since my Dad started my garden for me. I have been watering and weeding and watching in amazement as the veggies have grown so quickly. So many of my veggies are doing great and when I made these little burgers, we were able to use some of the green leaf lettuce from our own garden to make little wraps! So fun and exciting to harvest your own produce. I don't know how I found this recipe, but I had a little feta in the fridge and these little patties can be made ahead, so they were the perfect thing to mix up before church and grill as soon as we walked in the door. I used my indoor grill and we were eating lunch within about 15 minutes. These burgers were flavorful and juicy. 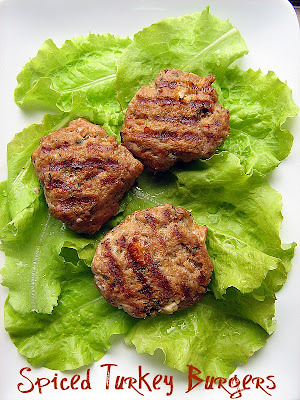 I made them into smaller patties, so that we could have wrap them in lettuce leaves. Fun and delicious! I love eating fresh salads all year round, but they just seem to fit in with the weather better right now. We have enjoyed a couple of months of beautiful weather and after a pretty hot week last week, this week it seems that the weather has decided to cool down quite a bit. This type of weather makes me want to load up on fresh fruits and veggies and to make lots of cool salads. 1. 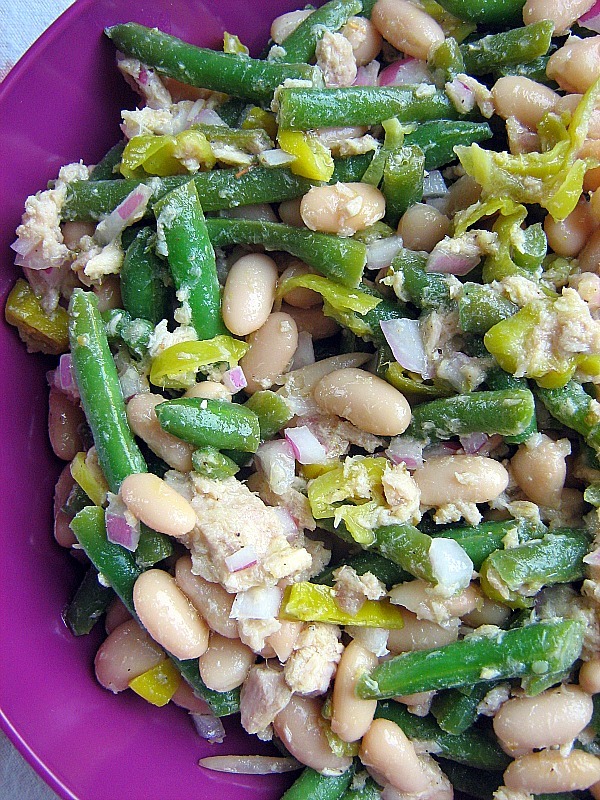 In a medium pot of boiling salt water, cook green beans until bright green and crisp-tender, about 3 minutes. Drain, rinse under cool water to stop cooking, and pat dry. 2. In a large bowl, whisk together vinegar and oil, and season to taste with salt and pepper. Add green beans, cannelini beans, onion, tuna, and pepperoncini and stir to combine. Serve immediately. I wasn't expecting to take a photo of these, but they were soo good and soo quick, that I felt I had to share them. I have made them a few times already and will continue to make them. 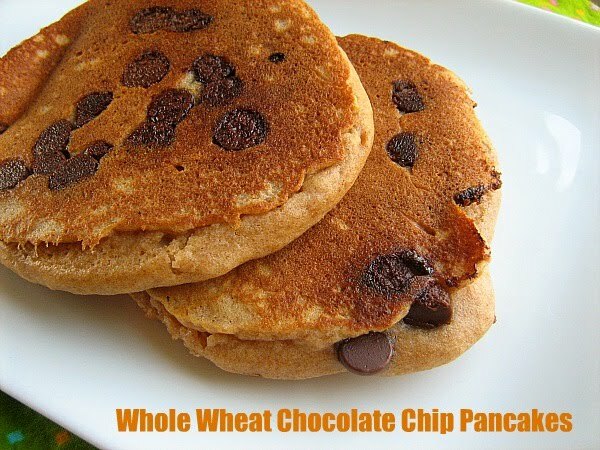 I just love it when a whole wheat breakfast tastes so good. Plus, chocolate chips can make any child love anything. The batter is simple and it takes just a few moments to mix up. So, go whip up a batch. They are fluffy and perfect! Unfortunately, I don't have time to make them today. We've got baseball tournaments, softball tournaments, a baby shower, a birthday party, another baseball game smack dab in the middle of that, and the list goes on. 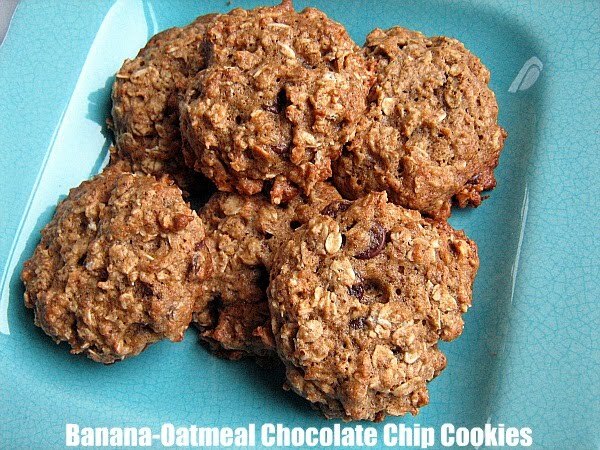 But, maybe tomorrow when the weekend slows down, I will make them again, because they are so delicious! Have a good one! I know I have described the love-hate relationship we have in this family with bananas. Sometimes they are gobbled up and other times, they sit and get brown. I am very particular about my bananas- if I am going to consume them fresh. They have to be just right. Not very ripe. Not mushy. Slightly green. And even if the conditions are perfect, I'm still not crazy about them. Anyways, it's the same old story. Bananas sit there and get overripe. What to do? Smoothies? check. Banana bread? check. Muffins? check. Banana pancakes? check. Tons of things I don't even have the chance to take pictures of and post about? check. Like these and these, for instance. So, I present to you yet another option for those times when you have ripe bananas and need to get rid of them immediately. These were the perfect after school snack. And if ripe bananas disappeared as fast as these cookies did, there would never be such a dilemma. I'm not exactly sure if I have ever had mustard greens before. I think I probably have, but I didn't realize it. I mean, I do live in the South, after all. Anyway, I think this was a possible first. At least it was the first time I have purchased mustard greens and prepared them. Dark greens are my friends. I love kale, collard greens, spinach, swiss chard- all of it. These guys were a little bit bitter/spicy/peppery- I'm not sure how to describe it. But, if you are familiar with them, then you probably know what I mean. That's probably why the word mustard is used to describe these greens. Last week was a crazy-busy week. I had a few fun jobs-( cupcakes, cake, catering lunch), lots of responsibilities, kids activities, and I didn't feel well for a few days. This dish came to the rescue one night because it was super fast and easy and I felt like it was a good meal. I served it over brown rice and we had some fresh corn on the cob also. I'm getting so excited about all the fresh veggies and fruits that abound in summertime! I absolutely love this time of year. I reduced the amount of red curry paste by about 1/2 Tablespoon, because it can carry a lot of heat and I wanted my kids to eat this. I also used vegetable stock, instead of water. I think this would be tasty if you wanted to use a different dark green in place of the mustard greens. 1. Whisk together curry paste, sugar, garlic, and 2 Tbls water in a small bowl. Set aside. 2. Heat oil in wok or large skillet over medium-high heat. Add eggplant and onion and cook 5 mins, or until eggplant is browned. 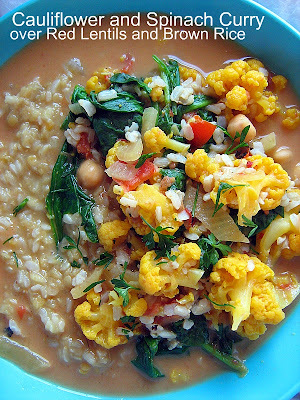 Stir in curry mixture and cook 30 seconds, or until vegetables are coated. 3. 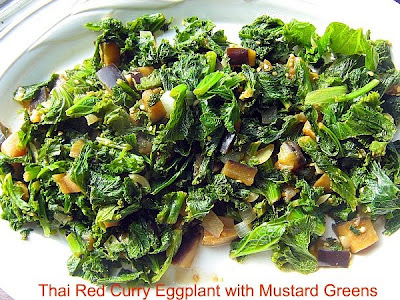 Add mustard greens and cook 1 to 2 minutes, or until leaves are wilted. 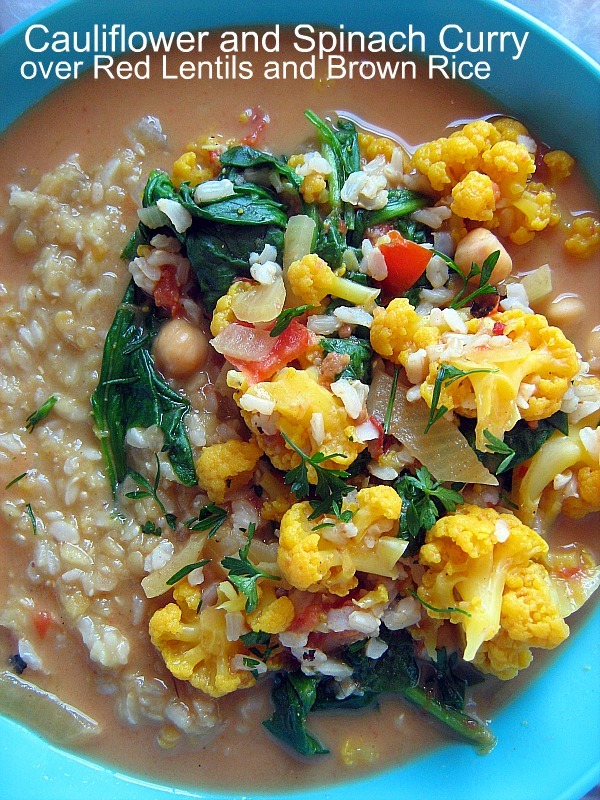 Stir in coconut milk, and 1 1/2 cups water, and season with salt, if desired. 4. Cover and bring to a simmer. Reduce heat to medium-low, and simmer 10 to 15 minutes, or until eggplant is tender. 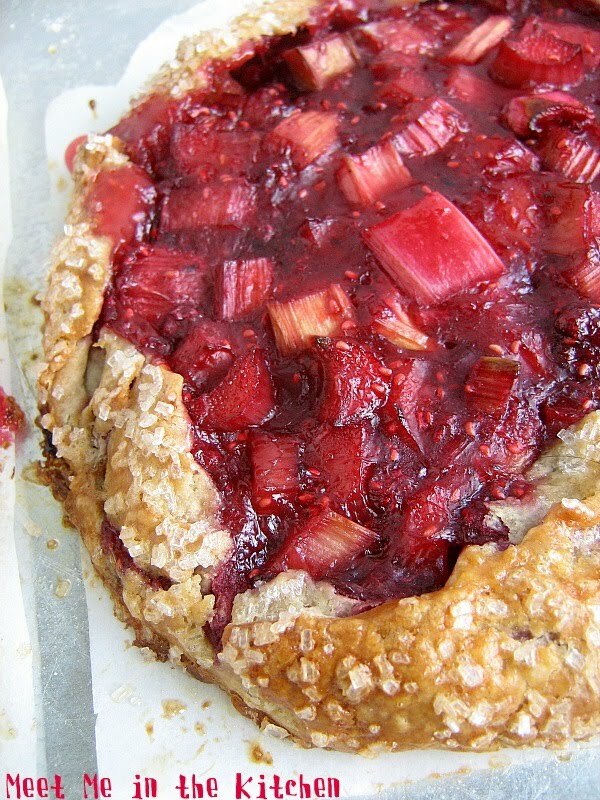 Rhubarb, Rhubarb- I love you, Rhubarb! I grew up eating lots of rhubarb and every Spring when it makes an appearance, I try to decide what I want to make with these precious stalks. I've been on quite a sorbet kick lately and had been wanting to try Rhubarb sorbet for quite awhile, so that is the first thing that I did with my rhubarb. 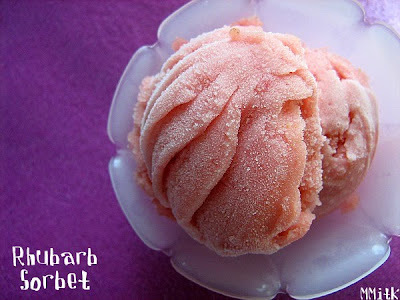 Sorbet has got to be one of the easiest desserts to make. This one is no exception. Chop a few things, throw them in a pan, let it cool and churn away. You don't even have to churn if you don't have an ice cream maker. You can freeze and stir with a fork and then puree in the food processor. I used that method last time. This recipe contains fresh ginger and orange zest, so there is a complexity of flavors, but you can really taste the rhubarb shining through. I did not strain my puree, because I hate to waste any of the rhubarb and I like the bite you get from a little piece of ginger sometimes. I do wish I would have reduce the amount of sugar I added though. The finished product was just a tad bit too sweet. One of rhubarb's best qualities is that tart flavor and the sugar took too much of that away. But, that is just my opinion, of course!